Luis Goncalves shares this exercise in his book Getting Value out of Agile Retrospectives a book written by him and Ben Linders with the foreword from Esther Derby. The book can be downloaded by free in LeanPub.com or InfoQ.com, please download it and spread it within your network. Originally, “High Performance Tree” was created by Lyssa Adkins. She explains this exercise in more details in her book “Coaching Agile Teams: A Companion for Scrum Masters, Agile Coaches and Project Managers in Transition”. “Metaphors are a core skill that are taught in professional coaching courses”, Lyssa Adkins refers in her book. The High Performance Tree is a exactly a metaphor to help teams create a vision and a path that leads to high performance. With this exercise teams may find next steps to achieve high performance. This exercise can be used by any team in several different ways. The maturity of a team will affect the way this exercise is performed in a team. First you should define a maturity team level and then adapt the exercise. Teams need to have strong roots to be highly productive. When the roots are solid and strong, the tree can grow and flourish. 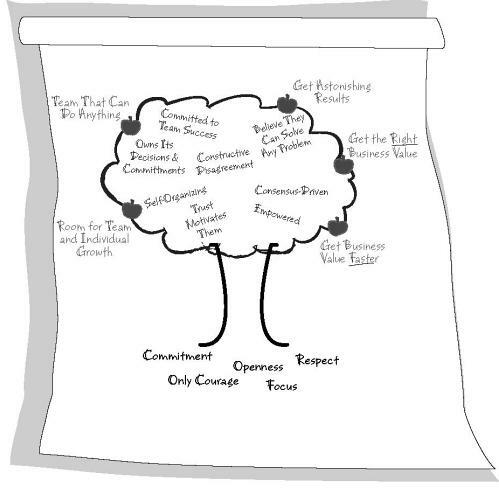 A coach draws a tree of 5 Scrum values as roots. This is a good opportunity for the coach to teach or refresh the meaning of Scrum values. Commitment is the state or quality of being dedicated to a cause, activity, etc. A commitment should never be broken and if it is broken, it was not a commitment but an empty promise and a lie. In the Scrum world, this means that everyone involved in developing a product is committed to working towards a common objective. Courage is the ability to confront a fear, pain, a danger, an uncertainty, or intimidation. In software development, all these feelings will be always present and it is up to team members to try to resolve anything that prevents them from being successful. Openness is the ability to be open to new ideas, new approaches and new ways of working. This is a principal state in Agile software development, because every day teams encounter different problems that need to be approached differently; being open is mandatory for achieving success. Focus is the process of concentrating on one aspect of the environment while ignoring other things. In software development, this means that teams should completely concentrate on one topic at a time, they should not start a new topic before finishing a previous one. After going through the Scrum values you can list characteristics of high performing teams. For example: Empowered, Consensus-Driven, Constructive Disagreement, Self-organised, etc. By having this combination team can do anything, they can get great results, right business value, deliver value faster, etc. See an example on the right side. This is a great tool to use in retrospectives. This tool helps new teams to be aware of the they need to achieve a high performance. Established teams can always come back to the picture and analyse what is missing on their journey to high performing teams.